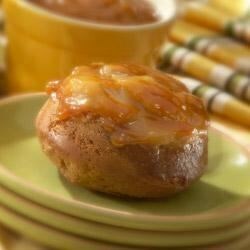 "You'll flip over these little cakes made with slices of Golden Delicious apples, spice cake and Marzetti® Old Fashioned Caramel Dip." Preheat oven to 350 degrees F. Grease two large six-cup muffin tins. In a microwave safe bowl, combine apples, cinnamon and water and microwave for 3-4 minutes. The apples should be slightly tender. Drain apples and toss with 1 cup Marzetti Old Fashioned Caramel Dip. Divide the apples evenly into each cup. In a large bowl, combine cake mix, pudding, oil, sour cream and eggs and mix on medium speed until smooth. Spoon the batter evenly over apples. Baked 15-18 minutes or until a toothpick inserted into the center of each cake comes out clean. In a microwave safe container, microwave the remaining Marzetti Old Fashioned Caramel Dip for 10-30 seconds, stirring every 10 seconds. Spoon warm caramel over cakes. Serve with whipped cream or ice cream. This is super good! I made it as a cake instead and buttered the dish to help it slide out better. Make sure it has cooled before you try to take it out as it will fall apart. Absolutely yummy ! !